Selling Kangaroo Pizza Online Gave My High Street Shop Traction. As you may have read in my last blog, there has been a lot of press recently on the death of the high street – but some occupiers are positively thriving. For this blog, in the same way as the last one, I decided to speak to some of our clients and find out why they are doing well when others aren’t, and if there are any lessons to be learned for entrepreneurs, property investment companies and developers when looking at their success stories. Last week, I had the opportunity to speak to Maciek Troscianko, the CEO of The Real Pizza Factory. Maciek has just opened two new ‘pizza showrooms’ as he calls them. One of them he happens to rent from SRA Ventures. Now here’s the unique thing about Maciek - he doesn’t consider himself to be a retailer. Instead, he considers himself a tech entrepreneur. How can a guy who runs a pizza shop be considered a tech entrepreneur, you might well ask? I asked Maciek that very question to give budding entrepreneurs a few pointers. Prior to setting up the Real Pizza Factory, Maciek ran the Kublai Khan restaurant. The restaurant wasn’t doing particularly well so Maciek decided to leverage the staff and the kitchen and set up an online pizza-only business. The new business grew exponentially and Maciek gave up the restaurant to concentrate solely on the pizza business. To complement the pizza business, he has now opened some pizza showrooms on the high street. At the peak of the business, Maciek delivers up to 10,000 pizza per month! Here’s how he managed his astounding growth. Out brand the big brands…. Tip from Shaf: Hiring an expert to do branding does not need to be expensive. There are hundreds, if not thousands, of branding experts on freelancer marketplaces who can do high quality branding for less than the cost of a good night out. If you have an idea and your research indicates that it will work, then go for it. Believe in yourself, and your vision, and that you will achieve your goals. Don’t sit around, or someone else may beat you to it – and use technology to quickly build scale. Technology should be an inherent part of any start up. Maciek said: “All of our marketing is done online, all our order processing is done online, and social media recommendations play a huge part in our sales growth. We use standard off-the-shelf packages such as MailChimp and Mandrill to do our online marketing which we bolster with SMS marketing. The biggest challenge we faced was when we set up; how do you get people to try a new product in a fairly saturated market from a brand they have never heard of? Tip from Shaf: A ‘loss leader’ is defined as a product on which you lose money, but through which you also generate sales of other products. Does it work well? You can be the lab rat - go to http://www.therealpizzafactory.co.uk/free-pizza-fb.html and order a pizza free of charge that will be delivered to your door. If you reorder, then loss leaders definitely work! “We feel our menu is one of the most unique available. We offer exotic pizza toppings such as Kangaroo, octopus, caviar and Venison. People are often attracted to the idea of getting something different from a boutique, independently-owned business. Our marketing made great play of the exotic options that were available on the menu. Note From Shaf: Please note the picture used in this Blog is not real it has been ‘Photoshopped’. 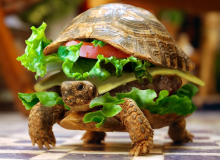 No tortoises were hurt in the creation of this Blog.